How to make curtains is often overlooked by many people as they believe they dont have necessary skills or time to attempt to make their own curtains. If you follow these easy steps I can guarantee you that will be making curtains in your sleep. Most people when they start thinking about how to make curtains get scared of failure and completely push the thought out of their mind very quickly. I can show you a fool proof way to make your new curtains for any window in your home. When deciding what window you would like to cover always ensure that you have measure the area correctly, your first measurment in curtains is always the width of the window , followed by height or drop of the window. When measuring the width, put your tape from edge of architrave to the architrave, this is your width, to measure the height, put your tape on the top of the architrave or surround and measure down to where you want the curtain or drape to finish. I have developed the easiest formulae that you can use when you want to learn how to make curtains, take the width of window , as an example we will use 2000mm and double this measurment , ie 4000mm, we now divide this measurement by the width of the material we are going to use, ie if the matieral is 1200mm wide – so our no-brainer formula looks like this 4000mm divided by 1200mm = 3.5 approx, this means we now need 4 lengths of materials or drops to cover the area we require. So we now multiply the amount of drops we require by overall height of the window, before we do this , if we have an overall height of 2100mm we always add 400mm to this measurement to allow for hems . So our simple formula will look like this 4 widths of material / multiplied by 2500mm = 10000mm or 10 metres of material. Generally 10 metres of material will cover a window. For an exact amount of material for all windows refer to our fabric table page. Ok so thats the hard part done , we know how to make curtains in fairly simplied matter. We now have 4 lengths of material 2500mm in height, if you are having a centre opening curtain it means you will create what we call a 2 x 2w curtain at 2100mm drop. If you are going to have curtain going to one side only you will create a 1 x 4w curtain at 2100mm drop. How to make curtains is simple process that can be completed within 2 hours for every curtain, now you will need to purchase 5 metres of pencil heading tape. In this example we are making a pencil pleat curtain, for pinch pleat please go to our full instructions on how to make a pinch pleat curtain in 10 easy steps. The first thing we need to do is sew our 2 panels togeather for each curtain, so now have a 2 x 2w curtain, now we must sew the pencil pleat tape on the top of the curtain, fold down 10cm of the material and position your tape at the top of the curtain and sew to rows of stitching across the top of each curtain, firmly holding the tape in place. When putting your tape on always ensure that the little pockets are facing upwards when sewing, too many times i have seen people sew their curtains with the tape reversed, they then have to unpick and start all over again, this is one of the most important parts on how to make curtains. After you have completed the top section, now turn each side of the curtain in 5cm doubled and stitch down the sides in a straight line, keep going we are nearly finished our first curtain. Generally the bottom hem is the last piece of the curtain to be completed, turn your hem up 10cm and double and sew along the bottom of curtain in a straight line. All thats required now is to hang your curtains. Remember the following formula window width , divided by material width, tells us how many widths we need, multiply this figure by our overal drop including an extra 40cm on each drop, this shows us how much material we require. 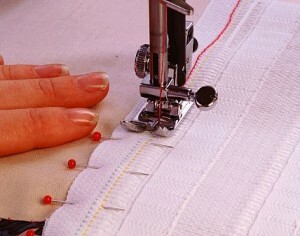 This is the simplest way on how to make curtains.